One of my favorite things about the Fall is playing in the leaves, of which we're never in short supply. This year Elijah enjoyed swimming in the leaves, bobbing under the leafy surface so that we could barely see him. Playing in the leaves every Fall has become somewhat of a family tradition. It's an awesome sensory experience for Elijah. A sensory experience of which Elijah takes full advantage. Yes, he comes up from his leaf dives with a mouth full of leaves. Hmmm, perhaps I should add a leaf dish to my meal plans. Elijah seems to enjoy it. Bobbing up like a little toy. Leaves crackling and crunching the air. Watch the play of a little boy. Each of us looks and smiles with joy. There is a swirling in the leaves. Whoosh and Wee, his father retrieves. Bringing out Elijah, our Guy. Dad is rewarded with giggles. For on he must climb to the top. There is no time to think or stop. 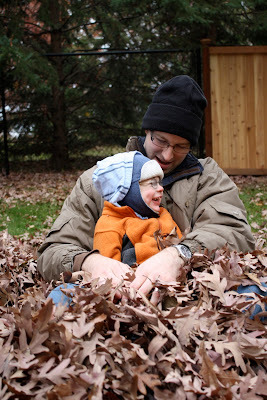 Coming up with leaves in his mouth. Which direction, north or south? I know you can get it just right. Each leaf adds its own gourmet taste. Off he goes as each leaf is chased. These leaves are all in a day’s work. It’s nothing Elijah can shirk. Mom, I LOVE your poem. Thanks for sharing it here. You're the best.